Perhaps we should put some chess on the chess site too! By request, for those that have not seen it yet, Game 8 of the World Chess Championship that is currently going on in Moscow between World Champion Vishy Anand and challenger Boris Gelfand. Gelfand made a miscalculation getting his queen trapped and ended up resigning on move 17! It is one of the shortest decisive games in World Chess Championship history. UPDATE: As of this morning (5-30-12), the match was won by Anand, retaining the title of World Champion. The first 12 games ended with a tie score of 6-6 (one win each and 10 draws). The match was then decided by a 4 game playoff match of quick time control chess (approximately G/30). Anand won the second game of the quick chess match when Gelfand made a mistake in a drawn ending under time pressure. 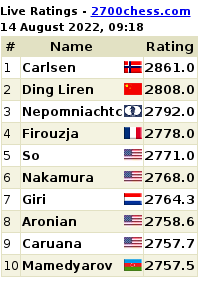 Anand drew the other three games to win the playoff 2.5 pts-1.5 pts.